Mayor Rahm Emanuel and the Chicago Department of Cultural Affairs and Special Events (DCASE) have designated 2017 the “Year of Public Art” with a new 50×50 Neighborhood Arts Project, the creation of a Public Art Youth Corps, a new Public Art Festival, exhibitions, performances, tours and more—representing a $1.5 million investment in artist-led community projects. Managed by DCASE, the 50×50 initiative will provide up to $1 million for new public art projects. The initiative was inspired by Chicago’s 50 wards and the 50th anniversary of two of our most seminal public artworks (the Picasso in Daley Plaza and the Wall of Respect which once stood at 43rd Street and Langley Avenue on the South Side). Guidelines for artists who are interested in applying will be available in January at cityofchicago.org/dcase. For the first time, up to 25 percent of the Individual Artists Program (IAP) grants awarded by DCASE next year will be earmarked for public art projects—a commitment of more than $100K. 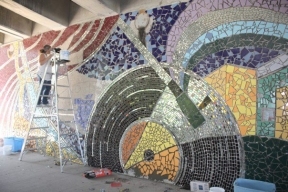 Interested local artists can access IAP guidelines at chicagoculturalgrants.org starting November 1. Mandatory application assistance workshops begin November 7. The IAP application period opens December 1, and the deadline for applications is January 13, 2017. A robust schedule of free and low-cost Year of Public Art events and exhibitions will available in January 2017. Highlights include a new Public Art Festival, performances, tours and exhibitions. For more information, visit cityofchicago.org/dcase—and join the conversation on Facebook (Department of Cultural Affairs and Special Events), Twitter @ChicagoDCASE #YOPA2017 #chipublicart and Instagram @ChicagoDCASE #YOPA2017 #chipublicart.